"I've always strived for the feeling that I have now," Jacob Banks says. 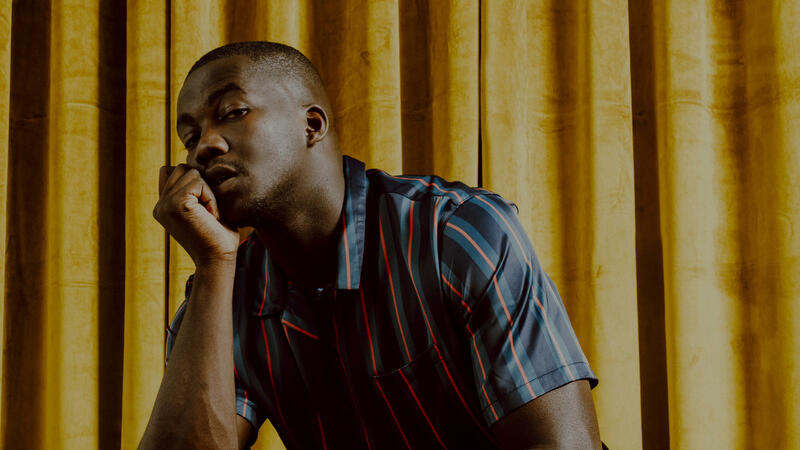 The first thing you'll notice about musician Jacob Banks is his voice — a mesmerizingly deep baritone with timbre so rich, you can almost feel it wrapping you up in song. But that's not all the 27-year-old R&B singer brings to the table. The U.K.-hailing artist was born in Nigeria but grew up in Birmingham, England and got into music seriously about seven years ago. After years of releasing well-received EPs and performing for fans both across Europe and in America, Banks has released his major label debut album, Village, out now via Interscope Records. Banks poured all of his influences growing up — his Nigerian roots, his love of blues, his stories with friends — into creating this debut. Even the title of the album comes from the African proverb "It takes a village to raise a child." It's taken some time to get the music just right, but Banks is grateful for the path that led him to this moment. "I've always strived for the feeling that I have now," Banks says. "I didn't want to make an album that I was dependent on to solidify my position as a human being." And although Village positions Banks to be a rising star, he remains lowkey. Case in point: Instead of having an album release party, Banks stayed home to play FIFA and hang out with his two cats. "The cats loved it," he says. "I enjoy being at home. And it was a good way to bring it in for me. I felt like I had my foot on the ground." The singer-songwriter spoke with NPR's Audie Cornish about the long road to releasing his debut, the emotional toll of performing and more. Hear their conversation at the audio link and read interview highlights below. On the cost of love inspiring his song "Chainsmoking"
My mom's a nurse, and she has four kids and she chooses to work nights so she can spend the days with us. So she would work 8 p.m. to 8 a.m., come home to us ready for school. Then while we're at school, she'll sleep, and then she'll pick us up from school, and then spend the day with us and go back to work at 8 p.m. And that was her system for years on end. And as time went on, it was kind of obvious that it wasn't the best option because she's now 52 and had to have her knees replaced. She just had the appendix taken out a couple days ago. [That] shouldn't happen to someone who's 52. And, I guess, the point of the song is love is expensive. It'll cost you time, hell, sometimes your sanity. But it's all we have, and it's all we have to stand by, and it's the only thing that keeps us going. There's a political side to that same message; [it's] we have to stand up for love every time, even though it's expensive. These are dark times, but all we have is each of our own and we have to stand up for one another. I think this is a double-edged sword, because I don't feel that the audience should care, in a weird way. ... My approach to being onstage is this: You've given me your time. Time is the only currency that matters to me. Money can be replaced, anything else can be replaced, but time, if you choose to come see me, if you choose to spend your 30 minutes or an hour or whatever it is, and you've given that time to me, I will put anything aside and give you a good show. That's one side of it. And the second side is these songs come from such a real place and to do your job properly, you have to keep that window open and you have to go through these emotions again. It always feels like it's just happening, for me, anyway. It can be tough but I think over the years, old songs take on new meanings, and hopefully they're more wonderful than the one before. ["Slow Up"] is about me, it's about me being a child. I'm the eldest of four kids, and I see so much of me in them. Unfortunately I see the need to want to break free so quickly, and I feel like people from marginalized groups, we often have to grow up a lot quicker than everybody else. And in your growth, you skip stuff, you skip communication, you skip love languages, you skip affection, you skip like how to talk about how you feel properly. You have to be so defensive so quickly, and you have to know how to protect yourself. And you give up freedom for that. So this song was a note to self, was a note to my younger self saying like I wish I was younger for longer. JACOB BANKS: (Singing) Oh, please be good to me. Oh, save my soul. The first thing you notice about musician Jacob Banks is his voice - raw, gritty, soulful. BANKS: (Singing) For far to long - oh, please be good to me. Be good to me. CORNISH: But Banks brings more than just his voice to his music. BANKS: Being born in Nigeria and moving to the U.K. and U.K. youth culture being Caribbean, I've had the pleasure of growing up around so many different sounds and scapes and influences. CORNISH: His new debut album is called "Village" because, he says, it took many villages to raise him. And all those villages contribute to the sound of the album. CORNISH: I want to talk a little bit about the music. And the song we're going to play is "Chainsmoking." Here's the opening of that. BANKS: (Singing) It's getting harder to breath chain-smoking your love - can't be good for my sanity, can't be good for my lungs - chain-smoking your love, chain-smoking your love. CORNISH: So within this dance production, I hear a very straightforward and old-school blues song. Can you talk a little bit about it? BANKS: Yeah. It's so weird hearing these songs 'cause I never listen back. Once it's out into the world, it's like someone else's now. CORNISH: So - no, no, so let's stick with that moment for a minute. CORNISH: What's it like hearing it right now? CORNISH: Wait; so you were playing soccer videogames. CORNISH: (Laughter) ...Which is about - what? BANKS: So my mom's a nurse, and, you know, she has four kids. And she chooses to work nights so she can spend the days with us. So she would work 8 p.m. to 8 a.m., come home, get us ready for school. And then she would pick us up from school and then spend the day with us and go back to work at 8 p.m. And that was her system for years on end. And as time went on, it was kind of obvious that it wasn't the best option because, you know, she's now 52 and had to have her knees replaced. She just had her appendix taken out a couple days ago. And it's - I guess the point of the song is, you know, love is expensive. You know, it'll cost you time, health and sometimes your sanity. But it's all we have, and it's what we have to stand by, and it's the only thing that keeps us going. BANKS: (Singing) It's getting harder to breathe chain-smoking your love - can't be good for my sanity, can't be good for my lungs. CORNISH: ...A friend who had passed. BANKS: (Singing) Dear Simone, I'm all alone, and I need you here to wipe my tears away. CORNISH: You know, we're listening to the music to help be the soundtrack to those emotions. CORNISH: We don't have to live it. BANKS: Yeah, I think it's just a double-edged sword because I don't feel like the audience should care, in a weird way 'cause my approach to being onstage is just you've given me your time. Like, time is the only currency that matters to me. Money can be replaced. Anything else can be replaced. But time - if you choose to come see me and you've given that time to me, I will put anything aside and give you a good show. So that's one side of it. And the second side is, you know, these songs come from such a real place. And to do your job properly, you have to keep that wound open. And you have to go through these emotions again. It always feels like it's just happening for me, anyway. And it can be tough, but I think over the years, songs take on new meanings. And hopefully they're more wonderful than the one before. CORNISH: ...Center stage as a singer. And I know you've talked a lot about being a writer and using different forms of expression. What was it like to just be vulnerable and just - it's just about you and the voice? BANKS: I think it was easier on this song because this song was for me. It's about me being a child. Like, I had to do so much work to get here, so many wrong decisions to get to this song. BANKS: (Singing) Don't you show off on me. Don't you grow up on me. Slow up, homie. Don't you grow up on me. People from marginalized groups - we often have to grow up a lot quicker than everybody else. And in your growth, you skip stuff. You skip love languages. You skip affection. You skip how to talk about how you feel properly. BANKS: Yeah, and you have to be so defensive so quickly. And you have to learn how to protect yourself. And you give up freedom for that. So this song was a note to my younger self saying, like, I wish I was younger for longer. BANKS: (Singing) Slow up, homie. Slow up, homie. CORNISH: ...Represents years of work. How do you feel now that it's out? BANKS: I feel grateful because I didn't want to make an album that I was dependent on to solidify my position as a human being. And I'm grateful that it came through. CORNISH: ...And played FIFA probably (laughter). BANKS: I - that's exactly what I did. And it - you know, it was weird for everyone. Like, everyone all around was like, oh, we should do a party. CORNISH: Oh, I thought you meant it was weird for the cats. BANKS: Oh, the cats loved it. They're great. But for me, it was to make sure I wasn't getting lost in the moment and I was doing what I would have done on any other day. CORNISH: Jacob Banks - his new album is called "Village." Thank you so much for speaking with us. BANKS: It's been a privilege. Thank you so much. BANKS: (Singing) You treat me like Obama. I barely know you. You want me to meet your mama. And I know that you've been praying for... Transcript provided by NPR, Copyright NPR.